The new 2019 Mercedes-Benz A-Class A 220 Sedan is certain to command attention on the Fort Walton Beach, Destin and Miramar Beach roadways. The sleek sophisticated contours of the 2019 Mercedes-Benz A-Class sedan’s exterior are refined with attractive 17-inch wheels, LED headlamps and taillamps. The inviting exterior of the Mercedes-Benz A 220 is matched by the well-appointed interior featuring premium amenities throughout and the game-changing new infotainment system called MBUX (Mercedes-Benz User Experience). The MBUX system offers a completely new user interface, natural speech recognition, touchscreen capabilities and a new Touchpad. MBUX represents a powerful user experience that also incorporates artificial intelligence to learn your habits over time and automatically adapts to changes in patterns of behavior. The in-car experience of the 2019 Mercedes-Benz A 220 welcomes a new era of connectivity with standard Smartphone Integration, featuring Apple CarPlay and Android Auto, along with a high-resolution widescreen cockpit concept, a 7.0-inch digital instrument cluster and 7.0-inch touchscreen multimedia display. A panorama roof adds to the luxurious good looks inside. 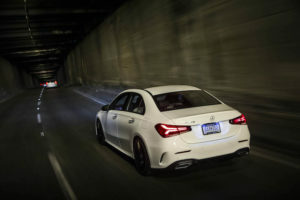 Fort Walton Beach, Destin and Miramar Beach drivers will also have the capability and handling they need on the Florida roads and highways with the new 2019 Mercedes-Benz A Class Sedan. Both the Mercedes-Benz A 220 and A 220 4MATIC® feature a 2.0L inline-4 turbocharged engine that produces 188 horsepower and 221 lb-ft of torque. This powerful and fuel efficient power plant is mated to a 7G-DCT dual-clutch transmission. Whether you’re traveling on US 98 or State Road 189, you’ll have the power and performance you need with the 2019 Mercedes-Benz A-Class Sedan. Experience the innovative new MBUX infotainment system and numerous features of the new 2019 Mercedes-Benz A 220 Sedan at ZT Motors of Fort Walton Beach. We’re conveniently located at 1000 Beal Parkway NW, Fort Walton Beach, FL 32547 and proudly serve motorists in Fort Walton Beach, Destin, Miramar Beach, Niceville and Santa Rosa Beach, FL.